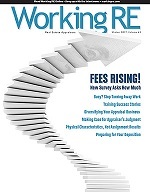 Editor’s Note: Appraiser Nelson Boswell shows us how to leverage new appraisal independence laws into more business. New federal legislation is leading to greater “appraiser independence” for many, but not in the way legislators intended. Smart appraisers are using the new laws to their advantage by adding new services and changing the course of their practice. Here’s how to make the new appraiser independence laws work for you and your business. What I mostly hear from appraisers is concern about how they can exercise their own rights under the new law. Or how they might change, resist or fight back against rules that appear counter-productive to the industry. While those ideals are worthy, this story takes a different tack. Most of what I hear and read from appraisers about the law is negative; appraisers see it not only as being unfavorable to them but favorable to other entities like lenders and AMCs. So how do once-prosperous appraisers take control of their future, in this new climate where control does not seem possible? First, you have to come to grips with the fact that the old ways of doing things are gone forever. Don’t spend another second wasting valuable energy even thinking about it. Second, you have to come to grips with the fact that subsequent to the new law, things are going to be in a state of flux for quite some time. And third, the wise appraiser is going to get as far out in front of this wave of change as possible, for his or her own benefit and that of their clientele. Finally, they will take advantage of these changes to seek new types of clients. In the process, appraisers will be educating themselves as to their own rights under the new law. The new law is large and complex. Its implementation and enforcement will be a huge, slow, grinding wheel. There will be inefficiencies. There will be contradictions. There will be regulatory changes. There will be challenges to enforcement. There will be precedents set in new case law. All of this will take time. What is criticized today probably won’t be a topic of discussion a year from now or two years from now. That sounds like a long time but we all know it’s not. 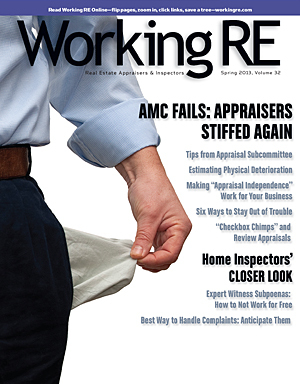 Appraisers are in a new climate of seriousness concerning their professionalism. Dodd-Frank appraisal independence has resulted in a newfound importance for FIRREA Title XI and the Uniform Standards of Professional Appraisal Practice (USPAP). The changes are of a very serious nature, meaning there is now enforceable law with real penalties for non-compliance. This is a good thing for the professional real estate appraiser and a bad thing for the unprofessional real estate appraiser. The appraiser who studies and makes understanding of Dodd-Frank, FIRREA and USPAP the first priority in his/her business, will be the appraiser who successfully guides his/her clients, or potential new clients, in the totality of Dodd-Frank, FIRREA and USPAP. This is to say, those who practice law in this area will practice law more effectively through the use of your expertise. Those who enforce compliance of the law will enforce compliance more effectively through the use of your expertise. Those who write policy will write better policy, through the use of your expertise. Those who guide other appraisers, or users of their reports as to their rights under the new law, will do so more effectively through the use of your expertise. Now, if you’re in a negative mindset, emotionally and physically exhausted, this is not going to sound feasible. The initial reaction of the discouraged will be to see this as an unrealistic way to take charge of their business, income and future. Hang in there! Most appraisers know enough of USPAP to do what they do on a day-to-day basis. But I imagine many real estate appraisers, especially residential appraisers, have never read FIRREA Title XI, let alone the Appraisal Independence section of Dodd-Frank. Many residential appraisers, if you surprise them with the question, could not state from memory the basic outline of Standards 1 & 2 of USPAP (even though they have taken the update course every two years for decades). The real estate appraisers who become the experts in these laws and regulations will create new opportunity for themselves, especially in light of the fact that most residential appraisers won’t bother. Appraisal law has finally become truly important. Many professionals involved with appraisal law and regulations have never practiced real estate appraisal and will need the professional assistance of appraisers to help them put these laws and regulations into context. Many, if not most of them are confused and in a state of trepidation. It is the residential appraisers (as opposed to non-residential appraisers) who will supply the all-important context to their new and existing clientele. I have made it my business to know the “Appraisal Independence” sections of Dodd-Frank, the changes to FIRREA Title XI, as a result of the new law, and USPAP. If a client or potential client has a question or concern (especially attorneys, in my case), I want them to come to me for help. Directly and indirectly this has resulted in new and interesting appraisal and consultation assignments. I think it will continue to be a growing segment of the residential appraisal industry, primarily non-lender related assignments. Or more specifically, non-residential mortgage related appraisal work. Aside from mortgage appraisal work, lenders and AMCs will need guidance more than any other sectors of business. In my case, the types of clientele I service are primarily attorneys in litigation-related assignments. Since changes in the law, with greater attention being paid to USPAP, I have increased my efforts in obtaining residential real estate appraisal review and appraisal compliance work. I am also a certified general contractor in Florida and focus on clients who may see this as an added value where material facts revolve around construction related issues. Whatever additional qualifications or related interests you may have as an appraiser, it is a good idea to take advantage of that to add value to their experience. Furthermore, I concentrate on large law firms. Litigation work is not a volume, or quantity type of business. For me, it is a quality type of business. Large law firms have more attorneys. There is a greater chance of repeat business and referrals via larger law firms. I concentrate on review and compliance work because the assignments are related to cases that have a long life from the time the complaint is served to the time the case is finally settled. They can take a year or longer. In that time you might have several different engagements of varying scope, all on the same case. The fees are usually based on an hourly rate. I should say I concentrate on any type of litigation that has a potential for a long life. From a residential standpoint, in my opinion, litigation-related assignments, like divorce and bankruptcy, too closely resemble flat fee work, with little opportunity for charging on an hourly basis for consulting work, or testimony as an expert in a deposition or court testimony. So I concentrate on that type of work less. There are numerous ways to implement a strategy where existing and potential clientele see you as the “go to” guy or gal in this new climate. It will take effort but the effort will pay off. If you have been appraising residential property for a long time you are in a good position to put your experience to work. You have probably developed a niche. You have been immersed in a field that has been in a state of metamorphosis for over two decades. If not for the new climate we are in, many residential appraisers would find themselves having to continue to do a greater volume or quantity of work, rather than having the opportunity to start doing more quality work. If you have not been in residential appraisal long, less than 10 years, you are in a good position to put your experience to work down the road if you start now. If you decide to implement a strategy that is divergent from the kind of business you are doing now, whether you have been a residential appraiser for a long time or not, you must realize a few indelible truths. By doing so, you will ward off discouragement. I’ll offer more specifics on the steps to create a successful consulting business in the next installment. Nelson Boswell, Jr., SRA is a Certified Appraiser in Florida and Nevada and a Certified General contractor in Florida with 28 years of experience. He specializes as an expert witness in appraisal and construction related litigation. Reprinted from Working RE, Spring 2013. Am I a Working RE subscriber?